6/3/2018 - St. Helena, CA – A weekend filled with surprises and generosity thrilled guests and prompted bidders to contribute more than $13.6 million to the Napa Valley Vintners’ (NVV) 38th annual Auction Napa Valley charity wine event. NVV confirmed the event’s final results today, after the online E-Auction closed at noon. Proceeds from Auction Napa Valley benefit community health and children’s education nonprofits serving more than 100,000 clients in Napa County. This year’s honorary chairs were the fourth-generation Mondavi sisters of the Peter Mondavi Sr. family, the Auction’s youngest leaders since inception in 1981. 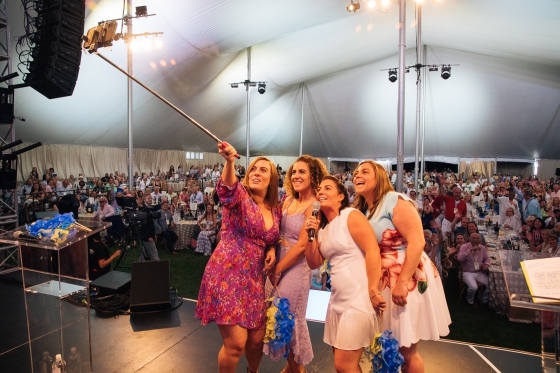 Angelina, Alycia, Riana and Giovanna Mondavi brought youthful energy to the wine-focused fete, including kicking off yesterday’s Live Auction Celebration in true Millennial fashion with a selfie shot from the main stage. Yesterday’s main event, the Live Auction Celebration at Meadowood Napa Valley, capped the three-day affair. Starting Thursday, Auction guests enjoyed private dinners with some of Napa Valley’s most well-known vintners and rising star wineries hosting these popular parties for the first time. The ever-popular Napa Valley Barrel Auction on Friday was held at the Mondavi family’s historic Charles Krug estate and featured an outdoor marketplace that replicated the villages and towns of Napa Valley and their iconic restaurants and wines. A new fundraising record for the Napa Valley Barrel Auction, which had Auction attendees vying with online bidders from anywhere in the world for the 110 lots of Napa Valley wine futures up for sale. Vintner Samantha Rudd of Rudd Oakville Estate and daughter of the late wine and food icon Leslie Rudd announcing a $1 million contribution from the Rudd Foundation after Lot Two at the Live Auction Celebration. The impromptu doubling of Lot 11 featuring four six-liter Imperials of Opus One and a once-in-a-lifetime experience for two couples to attend the Masked Ball at Versailles, France in 2019 that sold to two successful bidders raising a total of $1.4 million. A $1 million successful bid for Lot 20, donated by the Napa Valley Vintners and Lexus, featuring 18 bottles of Napa Valley wine and an experience at the 2019 U.S. Open Golf Tournament at Pebble Beach. A surprise after-dinner performance on Saturday night by Bay Area-favorites Michael Franti & Spearhead that brought the Live Auction crowd to its feet, dancing and smiling for nearly two hours. Appearances by retired racecar driver turned vintner Danica Patrick, pro golfer Natalie Gulbis and the mother and sister of Golden State Warrior Steph Curry, all of whom had an interest in one of the 32 Live Auction lots sold yesterday. Next year will mark the 75th anniversary of the NVV. To celebrate, more than 30 past chairs of the NVV Board of Directors are coming together to serve as honorary chairs of Auction Napa Valley 2019, which will be held May 30 to June 2. The honorary chairs are already hard at work to create an exceptional experience for Auction Napa Valley guests. A limited number of packages at $7,500 per couple go on sale tomorrow (June 4) at noon at auctionnapavalley.org. Learn more about how Auction Napa Valley supports the Napa County Community. See more than 2,500 social media posts from the event. Since 1981, Auction Napa Valley, the Napa Valley Vintners’ (NVV) annual community fundraiser, has utilized the worldwide reputation of Napa Valley wines and the scenic beauty of the region to enhance the health and wellbeing of the Napa County community. To date, the NVV has invested $180 million from Auction Napa Valley proceeds in local nonprofit organizations. Learn more at auctionnapavalley.org.